A peek in the window at some very appealing pearls, at especially tempting prices. First, Pearl Paradise, who sometimes offer how-do-they-do-it specials on classic pearls. This month, 8mm-9mm South Sea studs set in 14k yellow gold for $261, with free shipping for mainland US customers. 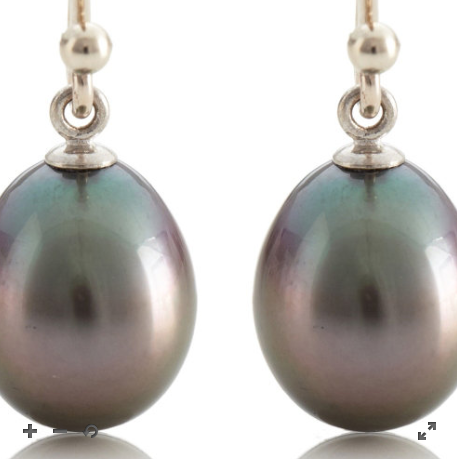 The poshest of saltwater pearls at an outstanding price, in time for its June birthstone status, if you need an excuse. These would also make a you-shouldn't-have gift. In an entirely different register, Kojima Company's Kasumi drops; not a "Kasumi-like" pearl, but the real Japanese-cultivated deal, set in 14k goldfill, with silver accent. Price, $207 (so with shipping, about the same as the PP South Seas.) A dramatic, lavish (13.2mm!) 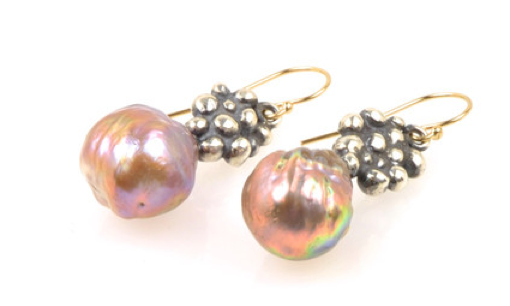 earring for women who like colourful, unusual pearls, or the more casual look of silver. Use that as your benchmark pearl and don't drop your standards, because a Tahitian without overtones is like George Clooney without his tux: handsome, but not exciting. Sarah Canizzaro, owner of Kojima Company, always describes her Tahitians accurately, and will search for you if you have a Tahitian colour dream, like cherry overtones. So, she describes these drops honestly: they have a colour gradation in peacock tones, a little banding and some very slight, tiny dimples, which to me say "can only be real" and add to the organic effect of this beloved variety. Set in 14k yellow gold, 11mm, and best of all: price, $396. 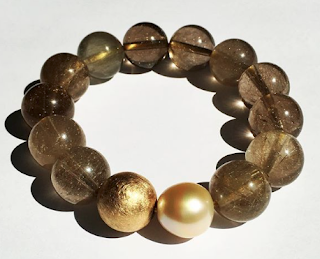 Pearls are versatile; coloured stones, while breathtaking, demand more thought. Like diamonds, pearls 'go' with everything, by day or evening. 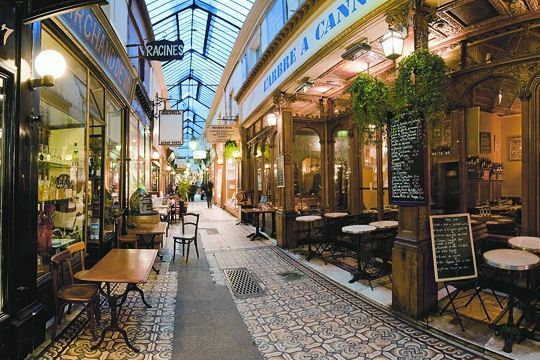 You can pile them on à la Coco Chanel, or wear only those South Sea studs, a murmur of elegance. 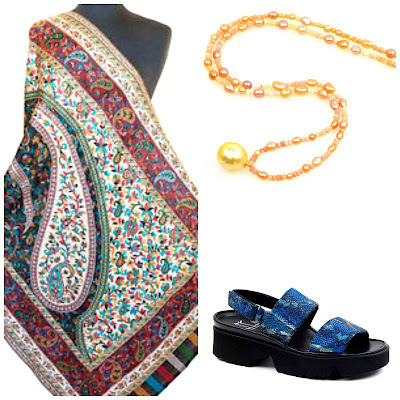 They also coordinate faultlessly with your coloured jewelry, from enamel to gemstones to glass. Finally, if treated with care, pearls will give lifelong pleasure, retaining their lustre and allure. 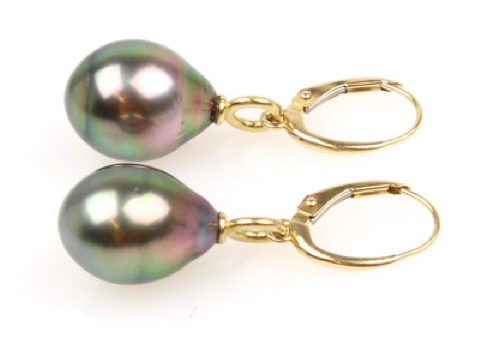 If you choose earrings, you can have beautiful pearls that really do light your face, for the price of a few jars of cream that turn out to not do anything but remind you of wasted money. 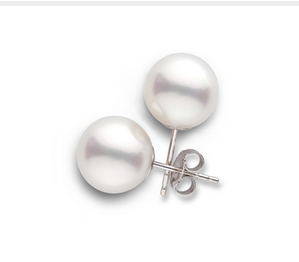 These are some stunning pearls, wow. What a great way to start my day. Thank you for sharing these beauties. And the sun is starting to come out at last, perfect. I love Sarah at Kojima Pearls! I have 3 necklaces of her pearls, and two sets of earrings I think. She's so flexible in terms of changing length or post type etc, and her quality of pearls and standards are amazing!! Thank you very much for highlighting her work several years ago! Lovely and tempting treats...you really do know your pearls. those large studs would really be perfect. I have a pair that are about 6mm, a gift from my Father and Mother. I keep telling myself I don't "Need" a bigger pair but they are getting harder to resist! Sisty: When I hit the drop-down menu the only choice is yellow gold. I like both colours in gold, and in these studs it is not going to show anyway, unless a woman has very short hair and cares what shows on the back of the ear. spacegeek: I agree. I once asked her to find a "dream pearl" strand, with very specific specs. It took her about 18 months but she did it, and at a very reasonable price. Jewelers ask me all the time where I got them. That makes perfect sense. I couldn't figure out why the color of the metal mattered.